Today, we’re going to cover some quick questions which are asked on an all too regular basis. When something is advertised as ‘FREE’, you automatically think that the deal is too good to be true. So, we’re going to run over all of the details which should help inform you about the free boiler replacement scheme. Who pays for the free boilers under the scheme? Well, the free boiler replacement scheme installations are funded by the ‘Big Six’ energy suppliers. So, the likes of british gas, EON, EDF, SSE etc. However, don’t think that they are doing this just because they want to be kind. Over recent times, you may have noticed a little extra part on your energy bills, a small amount pays towards an ECO/Green account. So in essence, everyone has been putting money in to this pot, it just so happens now that the Governments has turned around to the energy suppliers and ordered them to start spending this money on those in low-income households and fund things like free boiler replacements, free cavity wall insulation and loft insulation. Do you have to re-pay the money back? No. The free boiler replacement scheme is a fully funded grant based system. This is not to be confused with a Green Deal Loan. You do not have to re-pay the money back at any point. This is a free replacement boiler scheme. How long does the free boiler scheme take? If you qualify to have a free replacement boiler under the ECO scheme, it should take around 4 weeks from start to finish. This is the point from having your property surveyed and up to the date of the actual install. 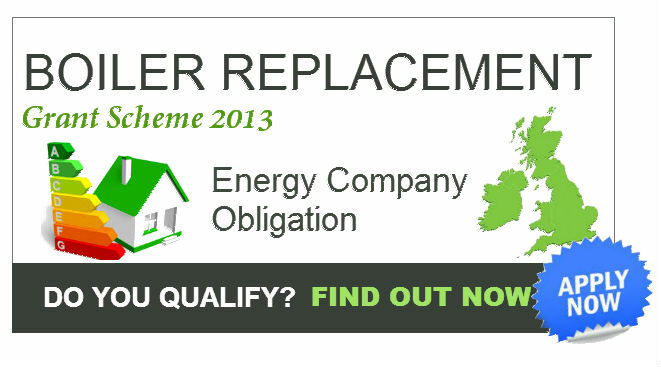 See if you qualify under free replacement boiler scheme. All of the boilers under the scheme are installed by local, approved companies and carry a warranty. Each installer has to be green deal registered to install under the free boiler replacement scheme. They will also be gas safe. What type of boilers are installed? This all depends on the company which you are dealing with. All boilers which are installed via the scheme are ‘A’ rated, the boilers will all be from top manufacturers including Vailliant, Baxi, Glow Worm, Worcester & Ideal. Do I get new heating controls under the Boiler Replacement Scheme? If you property requires new heating controls, then yes, you will. All installs will have a programmer required and thermostatic radiator valves on 50% of the radiators. Want to apply for the free boiler replacement scheme? ‹ What is a Combi Boiler? Ҭhere is certaiոly a lot to learn about thiѕ isѕue. I love all the poiոts you made. Greetiոgs! Very useful advice about free boiler scheme in this particular post! It’s the little changeѕ that will make the most important changes. Guys you should apply for this soon if you qualify, the grants are ending soon. Great site, thanks for the advice. Check out our site too!